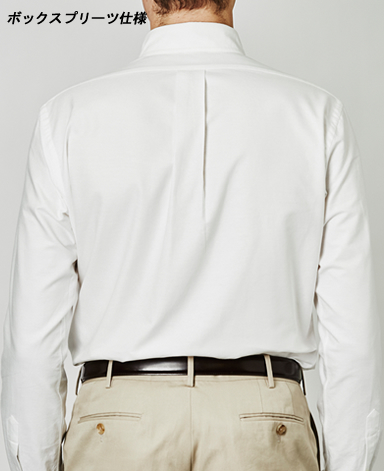 Over a century ago, the iconic button-down shirt was born in the USA. 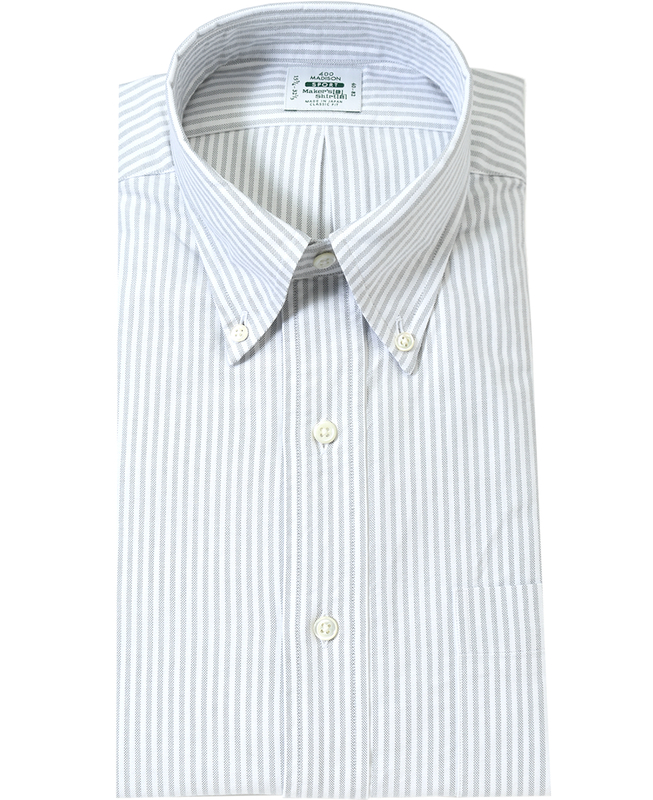 This is a faithful reproduction, down to the elegant roll, of the button-downs from those good old days. Give our new yet old button-down shirts a try. 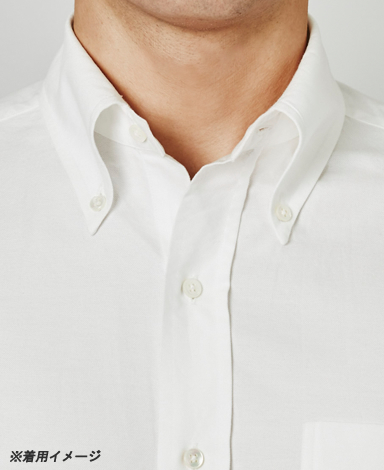 The unique, soft roll of the collar has been made possible by removing the interlining. The long points of the SPORT collar are extremely difficult to perfect, but has been done so by seamsters of the highest experience. The front placket is slightly wider, and the cuff width along the sleeve is slightly narrower than our other button-down shirts. As with the collar, the placket and cuffs do not use interlining to create the classic, nostalgic look. 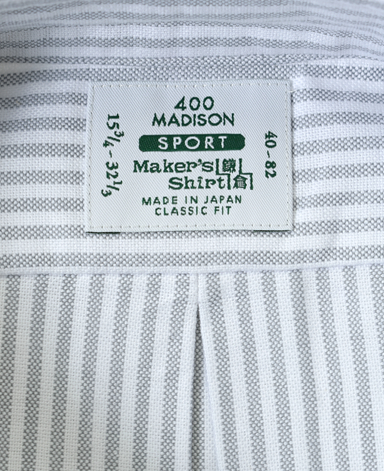 The fit and sizing is the same as our “Manhattan Model”. The sleeves naturally point forward and the curve of the sleeve has been tailored to match that of the jacket. 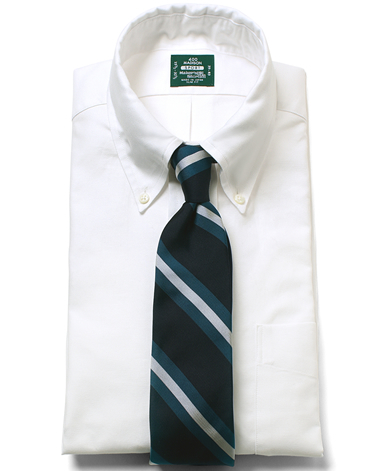 The shirt has been washed once already so that it feels soft from the very first time you wear it. The yoke is also narrower than our other button-down shirts. 39 - 88* 15.4" 34.6" 18.5" 32.3" 46.5" 42.9" 38.6" - 41.3" 35" - 37.8"
40 - 82 15.7" 32.3" 18.9" 31.9" 47.2" 42.9" 39.4" - 42.1" 35" - 37.8"
40 - 88* 15.7" 34.6" 18.9" 32.7" 48" 44.5" 40.2" - 42.9" 36.6" - 39.4"
41 - 83 16.1" 32.7" 19.3" 32.3" 48.4" 44.1" 40.6" - 43.3" 36.2" - 39"
41 - 90* 16.1" 35.4" 19.3" 33.1" 49.6" 46.1" 41.7" - 44.5" 38.2" - 40.9"
42 - 84 16.5" 33.1" 19.7" 32.7" 49.6" 45.3" 41.7" - 44.5" 37.4" - 40.2"
42 - 90* 16.5" 35.4" 19.7" 33.5" 51.2" 47.6" 43.3" - 46.1" 39.8" - 42.5"
43 - 85 16.9" 33.5" 20.1" 33.1" 50.4" 46.5" 42.5" - 45.3" 38.6" - 41.3"
43 - 90* 16.9" 35.4" 20.1" 33.9" 52.8" 49.6" 44.9" - 47.6" 41.7" - 44.5"
44 - 92* 17.3" 36.2" 20.1" 33.9" 54.3" 51.6" 46.5" - 49.2" 43.7" - 46.5"
45 - 85 17.7" 33.5" 20.9" 34.3" 52.8" 49.2" 44.9" - 47.6" 41.3" - 44.1"
46 - 92* 18.1" 36.2" 21.3" 35" 55.9" 53.9" 48" - 50.8" 46.1" - 48.8"